Babylonian Talmud, Tractate Arachim – with Rashi and Tosfot and Piskei Tosfot. [Venice]: Daniel Bomberg . First edition. 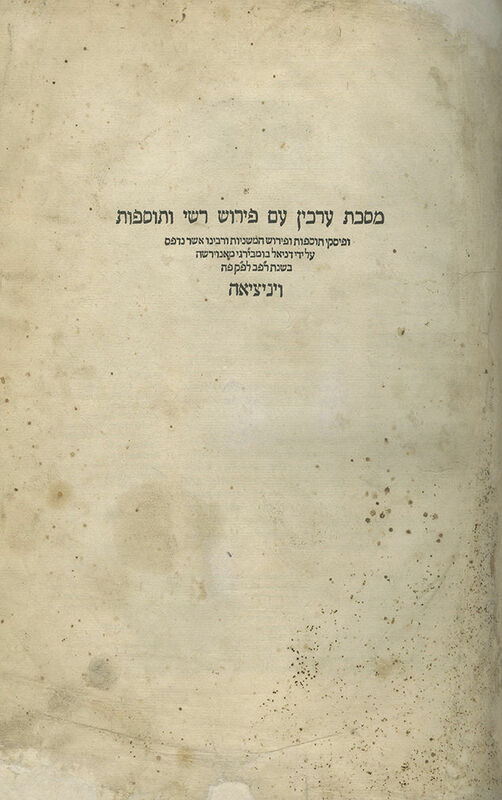 A volume from the first edition of the Talmud printed by the famous Daniel Bomberg in Venice. This edition was published in 1520-1523 and was the first complete edition of the Babylonian Talmud. It became the template for all further editions of the Talmud, introducing the pagination and the characteristic page layout customary until today (see: R. N.N. Rabinowitz, Maamar al Hadpasat HaTalmud, pp. 35-43). Gloss in early Sephardi script on p. 12b. The beginning of an incomplete gloss appears on p. 29a. Complete copy, including title page. 35 leaves. 36.5 cm. Light-colored, high-quality paper. Most leaves are in good condition. The title page is heavily stained, with damage and tears, repaired with paper. Stains and light dampstains. Infrequent light worming to the margins of a few leaves. New leather binding.